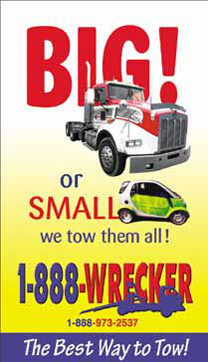 With the Schedule a Pickup tool, you can quickly and easily schedule 1888wrecker to come pick up your vehicle/load. Plus, it’s only when you schedule online that you get a Pickup History record, so you can check, edit or cancel your pickups. It’s fast and easy. Sign up now. Why use 1888wrecker online pick up tool? See pickups scheduled online, plus those completed and cancelled. Sort history by date, time, status or type. Edit or cancel if needed. Receive email notifications about job progress. Specify ready time and any special instructions.